Oakland starters have averaged 4-1/2 innings per start over the past 10 games. Scrambling to back off the workload of the heavily taxed bullpen, manager Bob Melvin and the Athletics brain trust decided to piggyback off the “opener” plan of attack originally employed by the Rays. 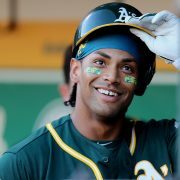 It did not go as successfully at the Oakland Coliseum Saturday night as it has much of the season in Tampa, and even after a late onrush driven by Khris Davis’ 40th home run of the season the A’s (81-56) couldn’t overcome a second-inning hole, falling 8-7 to the Mariners (76-60). This story has been updated with quotes and post-game material from the A’s clubhouse at the Oakland Coliseum. Davis’ 40th didn’t start or finish Oakland’s late push. Mark Canha, who got the A’s on the board with an RBI groundout in the second, made things a little more interesting with a two-run homer (15) in the fifth. By then though, the Mariners had already grab control of the night with eight early runs. Liam Hendriks, playing the role of “opener,” got things started with scheduled starter Daniel Mengden waiting in the wings. Hendriks (L, 0-1, 7.82 ERA) gave up two runs before his was lifted from his first start since Sept. 16, 2014 with two outs in the second inning, and when Mengden finally entered in the third he was anything but crisp. The point of using a reliever for the first inning, in this case two, Melvin said before the game, is to allow the starting pitcher to begin his night against the bottom of the opposing order. The advantage being, the “starter,” in this case Mengden, faces the bottom of the order three times and top just twice, squeezing one extra inning out of him. But after using three separate relievers to get through the first two innings, with Hendriks recording five of the six outs only to have the game’s first two runs score on a double surrendered by Danny Coulombe, Melvin sent Mengden out to begin his night against Seattle leadoff man Mitch Haniger. Mengden finally found his way to the mound in the third, and didn’t find his way back to it after the fourth. Even with the two-inning head start the A’s were unable to get their starter through the fifth, something Oakland starters have done just once in the past seven games. After pulling Mengden, Melvin began his role as drum major, leading a parade of green and gold-clad hurlers up and down the left field side of Rickey Henderson Field. In total, nine pitchers appeared for the A’s setting an Oakland franchise record for pitchers used in a nine-inning game — the 24 total players used also set and Oakland record. Issues with sustaining pace on the mound led to a lackluster defensive effort by the A’s. Sure-handed center fielder Ramón Laureano was credited with his first effort, and Jed Lowrie, in the midst of what has been the best defensive season of his career, dropped a pop up and bobbled a groundball, the latter ruled an error as well. 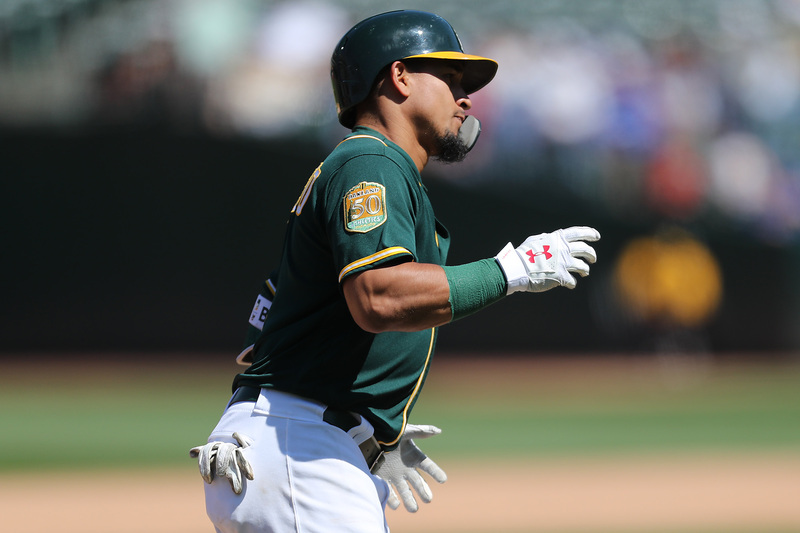 Though the two errors resulted in a mere one unearned run, it proved to be the difference after the A’s, who started Saturday with a major league-leading 97 runs scored in the eighth inning, added three after the Davis homer in the eighth. Unable to solve Seattle starter James Paxton (W, 11-5, 3.74 ERA), who struck out 10 in five two-hit three-run innings, the Oakland offense set the table against Colomé and Marcus Semien cleared it with a three-run double against All-Star closer Edwin Díaz. The strike fell short when Díaz (S, 51, 1.93 ERA) struck out Matt Olson stranding Franklin Barreto, the tying run, on first. Scheduled starter Edwin Jackson (4-3, 3.03 ERA) looks to reverse the fortunes of the A’s rotation and pitch Oakland to a series split with the Mariners. Félix Hernández (8-12, 5.49 ERA), coming off his best start since mid June, gets the ball for Seattle. With roster limitations expanded for September, the A’s made their series up moves Saturday adding eight players to the active roster. Among those added to the roster was catcher Beau Taylor who, in eight professional season, had never previously reached the major league level. To make room for Taylor, 28, on the 40-man roster, the A’s designated Bruce Maxwell for assignment. … With their loss to the Mariners and wins by both the Astros and Yankees, the A’s lost a game in all three playoff races. Oakland is now 2-1/2 games behind Houston for the AL West lead, 5-1/2 games behind New York for the first Wild Card spot and 4-1/2 games ahead of Seattle for the second Wild Card spot. Kalama Hines is SFBay’s sports director and Oakland Athletics beat writer. 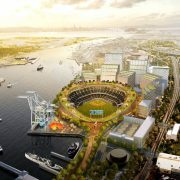 Follow @SFBay and @HineSight_2020 on Twitter and at SFBay.ca for full coverage of A’s baseball.